Stream Spanish-language movies and TV with Pongalo! • Over 13,000 hours of major US studio content translated into Spanish, like Punch-Drunk Love, Hellboy, and Two for the Money. • The largest collection (over 10,000) episodes of telenovelas and tv series, like La Mujer de Judas, Amor de Carnaval, and Corazón Traicionado. • Thousands of original programming and exclusive content. • Personal watch list for later viewing. • Share favorite shows and episodes. Pongalo is currently available on laptops, desktops, tablets, and mobile phones via the RBdigital app or web browser. If you do not have an RBdigital username, get one by clicking “Register” at the top of our RBdigital Homepage. You will then be prompted to create a Pongalo password. 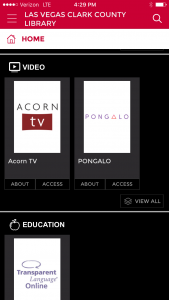 You can then begin watching Pongalo in a web browser! Pongalo is also mobile! 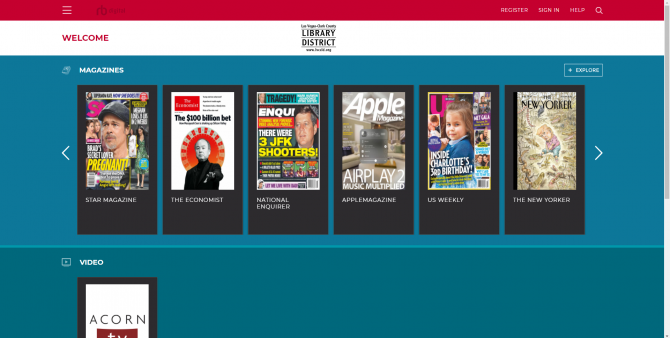 Download the latest version of the RBdigital app in the Apple App Store or Google Play Store. Once the app is downloaded to a device, Pongalo can be found by tapping the three horizontal white lines in the upper left-hand corner and then selecting Video. If you already have an RBdigital username and have the app installed on your device, Pongalo will be available under Video. Redeem a 7-day “access pass” that can be renewed upon expiration. Renewing lets you resume an episode just where you left off, or start a new show. This 7-day access pass gives you all access to Pongalo for 7 days. At the end of 7 days, you’ll be notified that your pass has expired and you can renew it.